To produce our high standards of quality, we strive to use the best materials and technology, to grow our crops in a sustainable way that promotes healthy eating and a healthy planet. A Bug Vac is a mechanical method of pest removal that literally “vacuums” up certain pests during strawberry production. This method significantly reduces the number of applications of crop care. 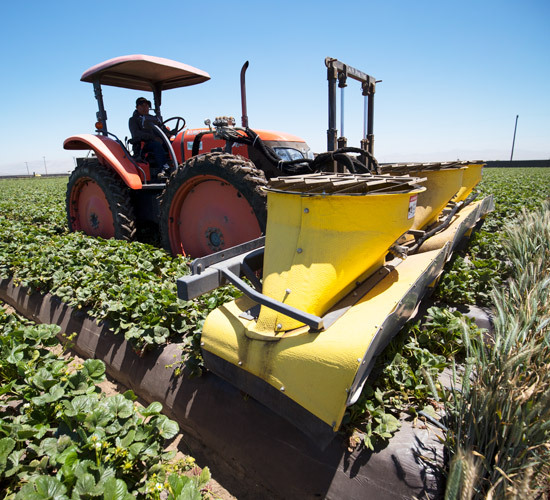 The Bug Vacs are large vacuums mounted on tractors that hover above the crop, and with no chemicals at all, effectively remove damaging pests. Another way that we minimize the need for chemical crop care materials is by utilizing Predatory Mites (Phytoseiulus Persimilis), which, when managed correctly, can be an effective biological control for use against certain damaging spider mites. These natural enemies do not bite people, feed on other insects or injure the plants. By investing in this green methodology, we have eliminated the use of sprays for spider mites. In an effort to ensure that our farming practices do not have any negative impacts on the water quality in our region, we have developed farm water quality plans for each of our farms. These comprehensive water quality plans address nutrient management, irrigation management, salinity management, pesticide management, erosion control and aquatic habitat protection.